Mt Garibaldi is the best known of the 3 Cascade volcanoes in BC, prominently rising nearly 9000 ft above tidewater at Squamish. The Cheekye FSR leading to Brohm Ridge provides the shortest access to the summit of Garibaldi, as long as you can tolerate lots of snowmobiles (when the road is snowcovered) or horrible driving conditions (when the road is bare). Although this route is shorter than those starting from the Diamond Head or Rubble Creek Trailheads, it is nevertheless quite long, involving miles of scenic but up-and-down traversing along the ridge to reach the glaciers on the upper flanks of the peak. The route starts on the WSW side of Garibaldi and wraps all the way around to the NE side. David Coleman and I set off from Seattle the evening of May 19, eating dinner in Squamish and then beginning the rough drive up the Cheekye FSR. Nearly 45 minutes were needed to drive about 8 miles up to 4300 ft, where the road is blocked by 1-2 ft of solid continuous snow at the last switchback before the summer gate. As usual, high-clearance 4WD was required to drive the last few miles, as the road surface consists primarily of loose rocks and boulders, with some mud and snow patches. Low-range 4WD was helpful for most of the upper section, above 3700 ft where the two forks of the road rejoin. [We drove up to that point via the right fork (main Cheekye FSR) and drove down the next day via the other fork (Brohm Crossover FSR to Brohm River FSR). We regretted the descent decision, as the right fork is in much better condition, while the Brohm Crossover FSR is an abominable streambed.] We set up a very scenic car camp at sunset on a large flat area on the road just before the switchback, with a view down to Squamish and Howe Sound, and slept secure in the knowledge that for at least once in BC this spring, we would be able to ski right from the door of the car. We enjoyed a spectacular sunrise on the Tantalus Range across the valley and then skinned up the road at 6:30am. The sky to the west was clear, but to the east towards Garibaldi itself there were lots of ominous clouds. Upon reaching the 4500 ft saddle where the road is gated in summer, the road drops 200 ft before climbing again to the Black Tusk Snowmobile Club lodge at 4800 ft. Another short descent leads to the final switchbacks which climb to the crest of Brohm Ridge at 5600 ft. We followed snowmobile tracks the whole way, but luckily the abhorrent machines were neither seen nor heard on this day. Heading east along the ridge, we eventually stayed low and left to get around the steep sidehill at the prominent rock tower above 6000 ft and then gained the west edge of the Warren Glacier at the low point on the moraines near 6600 ft. The Warren Glacier looked smooth and mostly uncrevassed below the spectacular hanging ice cliffs of Garibaldi's North Face, but we could see numerous seracs and open holes on the steeper climb around the toe of the North Ridge to reach the North Pitt Glacier. So we roped up at this point and traversed across the Warren, and then up onto the North Pitt to reach the flats at the base of the NE Face near 7100 ft. A brief shower dropped some frozen precip for a minute, but then the skies cleared nicely. However, the view of the NE Face filled us with dismay. The bergschrund at 8400 ft was open, much too open for May, and although it was clearly possible to end-run it, the route above was extremely exposed. The low snowpack this year strikes again, as most years the bergschrund here is not an issue until June or July. We skinned up the steepening slopes to 8300 ft just below the bergschrund. The route around it and above it looked to be 45-50 degrees, quite exposed to the bergschrund, and we decided not to attempt to climb it on foot. It had taken us about six hours total to ski the rolling 7.5 miles up to this point, and regretfully it was time to ski down, only 480 ft from the summit. We unroped and skied down at 1pm, and snow conditions surprised us a bit. We thought we had skinned up on decent corn, but actually there was a deceptive thin crust just below the surface which made things awkward and difficult to ski. We surmised that it had probably rained on the snow yesterday and frozen overnight. Below 8000 ft, things improved as the snow softened more and some decent turns could be found, along with spectacular ski photos with seracs, Black Tusk, the Table, and Garibaldi Lake in the distance (the lake is almost completely melted out, unusual for mid-May). We crossed a line of mountain goat tracks near 7000 ft, and saw the two goats in the distance traversing a steep slope, they had passed only minutes earlier. The rest of the ski descent was mostly sticky snow and slow traversing, to circumvent as many of the ups and downs on the ridge as possible. The sticky snow meant that skins were not needed until the very last climb up the road to the 4500 ft saddle just above our car. Just as we reached the car, a rain shower finally hit despite the bright sunshine where we stood. 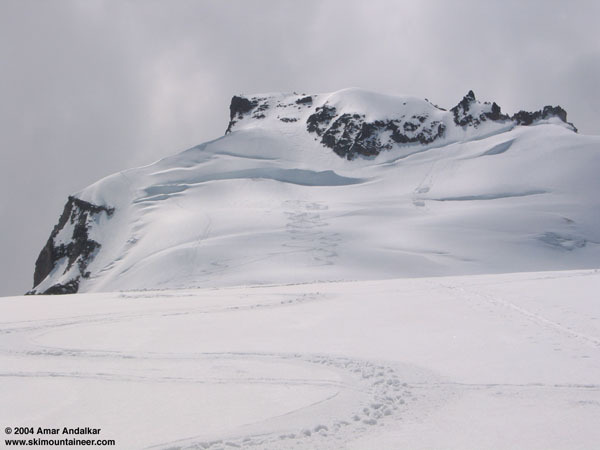 This photo looks back at our ski tracks on the NE Face of Mt Garibaldi, starting about 100 ft below the huge bergschrund. Later in the season, this bergschrund will span the entire width of the face. Click here for an enlarged version of this photo.